Mazel Tov to alumus Misha Bass and his wife Avigail upon the birth of a baby boy! The Bris will IY"H take place in Chicago this Wednesday, April 17, at Heritage, 2941 W. Touhy. 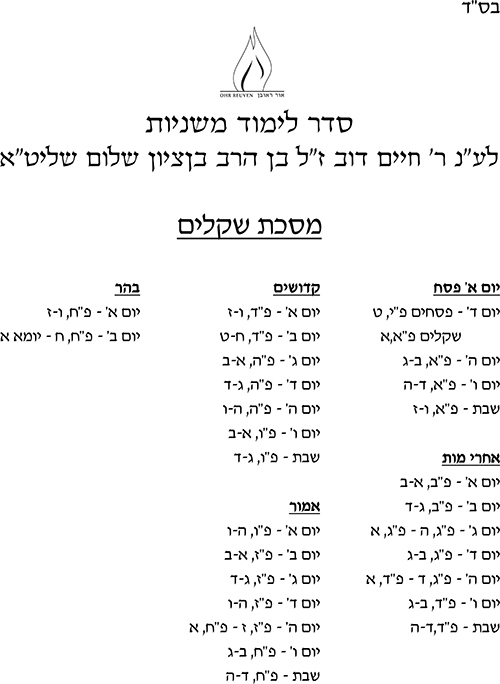 Shachris will be at 7:00 and the bris will follow at 7:40. Please see their invitation below. 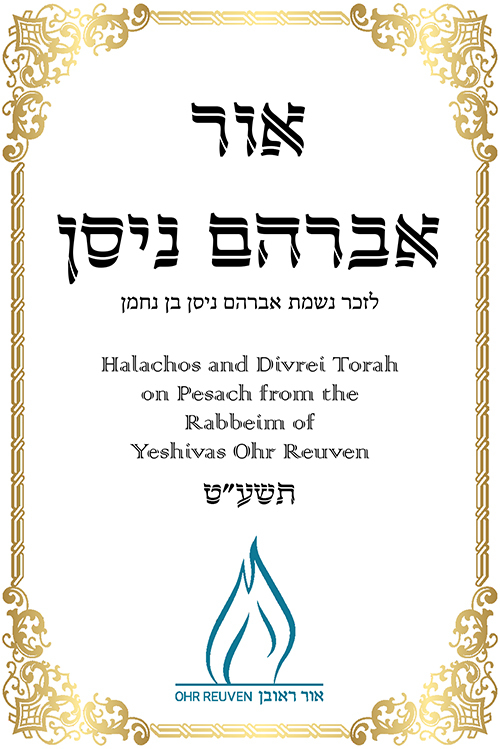 The Yeshiva has put out a small sefer on the Halachos and Divrei Torah on Pesach from the Rebbeim of Yeshivas or Reuven. The sefer, Ohr Avraham Nissan, was arranged, typeset, and edited by Rabbi Eliyahu Wincelberg, Yitzi Bemberger, and Akiva Gottlieb. It will be freely available tonight at Rabbi Apter's shiur. Anyone who would like a copy and will not be attending the shiur tonight should contact R' Eliyahu Wincelberg at ewincelberg@ohrreuven.com. The shiur can also be downloaded as a digital PDF. Click here or the image below to download a digital version of the sefer. The Mishnayos Yomi that was established by R' Tzvi Rudinsky as a z'chus for R' Dovi z"l is approaching Maseches Shekalim. 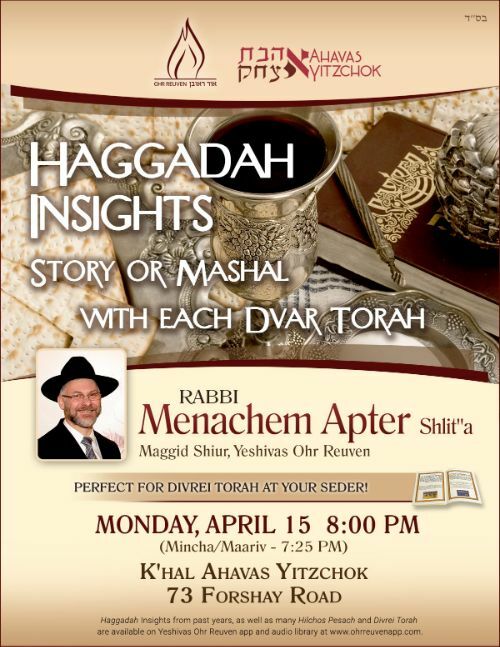 Rabbi Menachem Apter will be giving a special Haggadah Shel Pesach insights shiur on Monday night, April 15, at 8:00 in Kahal Ahavas Yitzchok. Please see the flyer below for full details. 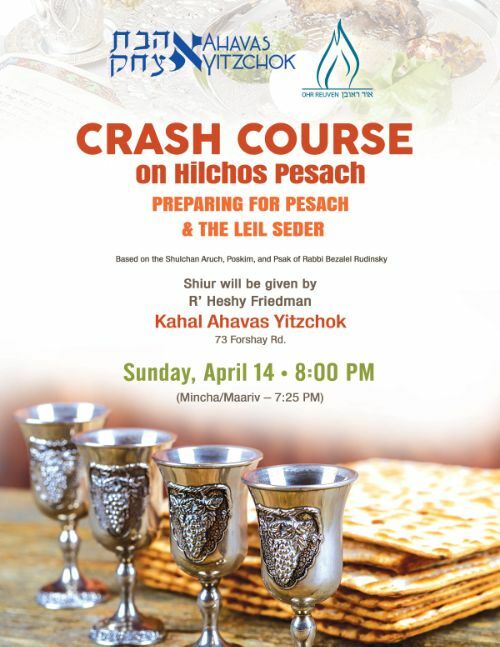 Please see the flyer below for a Crash Course on Hilchos Pesach which will be given on Sunday, April 14, at 8:00 PM at Kahal Ahavas Yitzchok. Yeshiva Dinner - Save the Date! 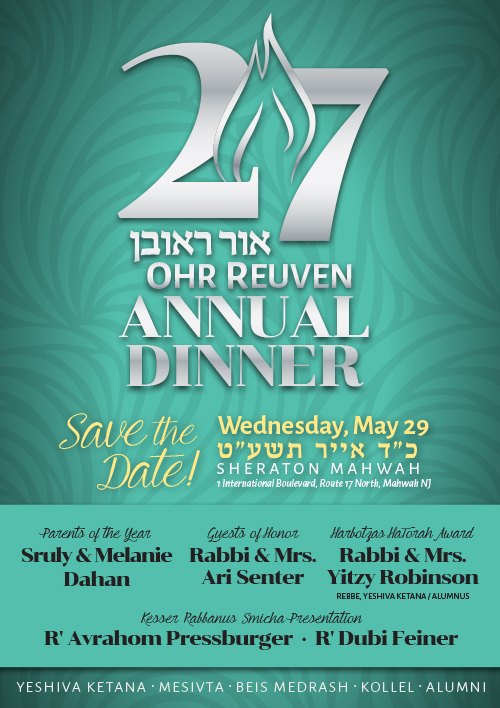 The Yeshiva Dinner will be taking place IY"H Wednesday, May 29, at the Sheraton Mahwah. Please save the date and stay tuned for more information. Please see the flyer below. 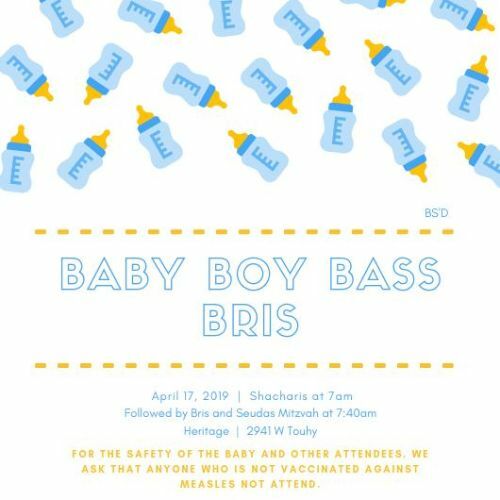 April 11 - Mazel Tov to Misha Bass! Mazel Tov to alumnus Misha Bass and his wife Avigail upon the birth of a baby boy yesterday! Simcha information will be emailed once it becomes available. Mazel Tov! 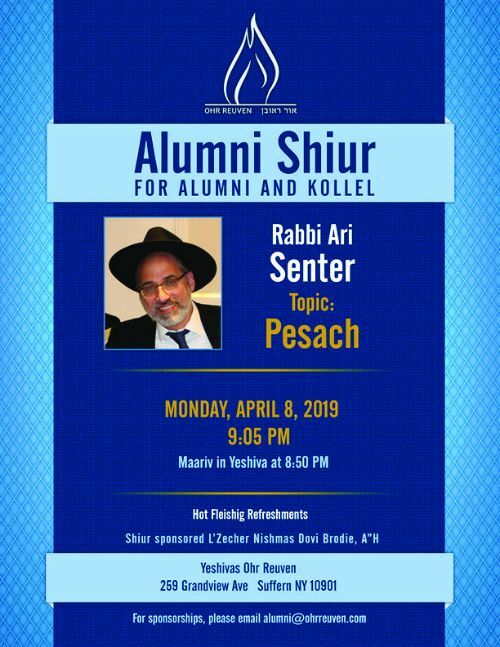 The Yeshiva will be publishing a Sefer of Divrei Torah on Pesach to be given out at Rabbi Apter's Shiur this coming Monday Night and mailed to all of the alumni who were at the Melava Malka who can't make it to the Shiur. If you would like to sponsor it (includes name of Sefer and optional dedication page) for $850 please contact Eliyahu Wincelberg ewincelberg@ohrreuven.com. Other sponsorships are available as well. If you will be unable to make it to the Shiur and would like to be mailed a physical copy or emailed a digital copy please email Eliyahu Wincelberg as well and specify whether you would like a digital copy or a physical copy. Rabbi Zev Leff will be in Yeshiva tomorrow morning and will be giving the Friday morning Parsha Shmuess after Shachris. Shachris begins at 7:40, and the Rabbi Leff's shiur will begin at approximately 8:25. All are welcome and encouraged to attend. 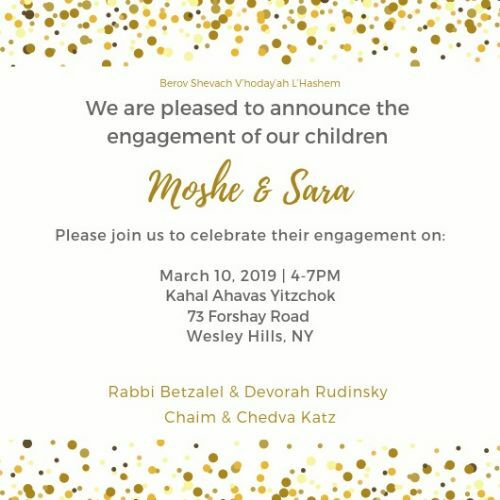 On behalf of the entire Yeshiva we would like to wish a hartzige Mazal Tov to the Rosh Yeshiva and Rebbetzin upon the engagement of Moishie to Sarah Katz, daughter of Chaim and Chedva Katz of Wesley Hills! Please see below for the vort information! On behalf of the Alumni and Melava Malka Committees, we would like to thank all those who organized this year's Alumni Melava Malka and made it a huge success! Thank you to Eli Shulman for putting the entire event together and being the real driving force, and to Reuven Frankel for taking care of the food. Thank you to the alumni board: Menachem Weinreb, Eli Shulman, Reuven Frankel, Yitzy Bamberger, Rabbi Raphael Vilinsky, and Heshy Friedman! Thank you to the Melava Malka Committee, and thank you to the Rosh Yeshiva and all the Rebbeim for all that they do. 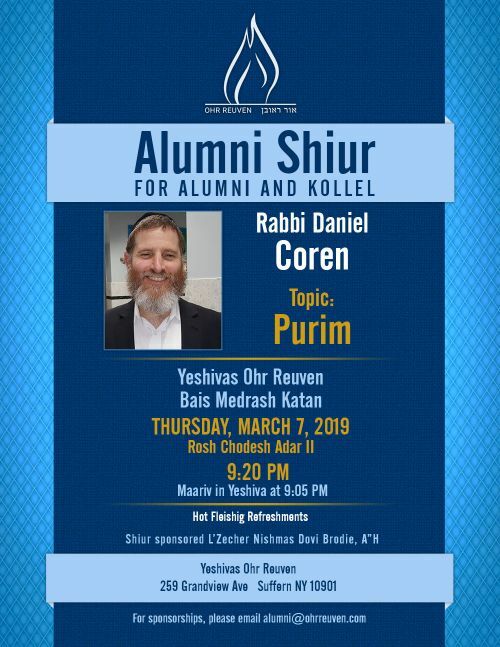 We have the honor of having Rabbi Daniel Coren give an alumni shiur this Thursday night in Yeshiva on the topic of Purim. Maariv will be at 9:05 followed by the shiur at 9:20. Please see the flyer below for more details. March 3 - Mazel Tov to Moishe Rudinsky! Mazel Tov to Moishe Rudinsky upon his engagement last night to Sara Katz, daughter of Chaim & Chedva Katz of Wesley Hills! Mazel Tov to the Rosh Yeshiva and Rebbetzin and the entire Rudinsky Mishpacha! Simcha information will be emailed when it becomes available. Mazel Tov! Copyright © 2012 Yeshivas Ohr Reuven. Website Developed by Radial Web. Website Credits.